"Schumann" redirects here. For other uses, see Schumann (disambiguation). 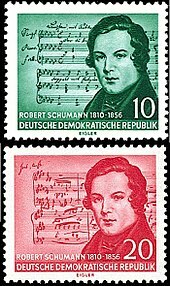 Schumann was born in Zwickau, in the Kingdom of Saxony, the fifth and last child of Johanna Christiane (née Schnabel) and August Schumann. 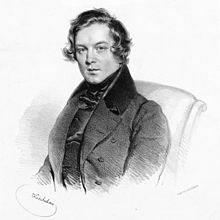 Schumann began to compose before the age of seven, but his boyhood was spent in the cultivation of literature as much as music—undoubtedly influenced by his father, a bookseller, publisher, and novelist. Peter Schamoni's 1983 movie Frühlingssinfonie (Spring Symphony) tells the story of Schumann and Wieck's romance, against her father's opposition. Robert was played by Herbert Grönemeyer, Clara by Nastassja Kinski, and Clara's father by Rolf Hoppe. The role of Niccolò Paganini was played by the violinist Gidon Kremer. The score was written by Grönemeyer and conducted by Wolfgang Sawallisch. 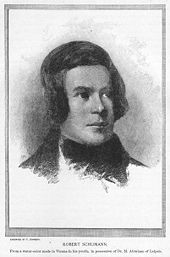 ^ Robert Schumann (1982). 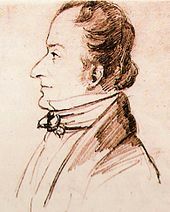 Konrad Wolff, ed. On Music and Musicians. Translated by Paul Rosenfeld. University of California Press. ISBN 978-0-520-04685-6. ^ Domschke, Katharina (March 2010). 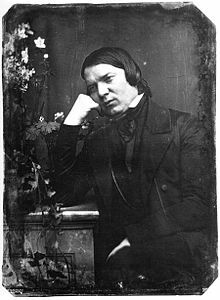 "Robert Schumann's contribution to the genetics of psychosis". British Journal of Psychiatry. 196 (4): 325. doi:10.1192/bjp.196.4.325. PMID 20357311. Retrieved 2015-06-17. This page was last edited on 29 March 2019, at 22:28 (UTC).